This is the December digital issue of Dark Reading. Access is free, but you must be a registered member of the InformationWeek Business Technology Network to download the issue. Please register below. There's no cost, and it takes only a few minutes. Once done, click the "Go To Digital Issue" button at the bottom of the page. Stop Data Leaks: The NSA leak showed that one rogue insider can do massive damage. Use these three steps to keep your information safe from internal threats. If You See Something, Say Something: Technology is critical, but corporate culture also plays a central role in stopping a big breach. 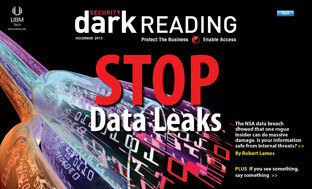 Your weekly keyhole into the chaos and mystery of network and data security. Look for this compilation every Thursday, chock-full of product and industry news, threat reports, vulnerability discoveries, compliance issues, and user experiences. In addition, there's also our enlightened and delusional commentary, as well best-of security stories from around the web. Yes, I would like to receive the Dark Reader Weekly Newsletter.